In last week’s CEO Briefing, you got to ask your questions live! If you missed it, you can read the transcript here. Dan is the brilliant inventor of a patented new way to prefabricate package water treatment systems that last up to four times longer than conventional methods. He came to us with a set of patents (that we’ve licensed worldwide) and a big “book of business”. He is now executing on that sales pipeline, brilliantly. We are basically building a “company within a company” around Dan! That’s Modular Water Systems. 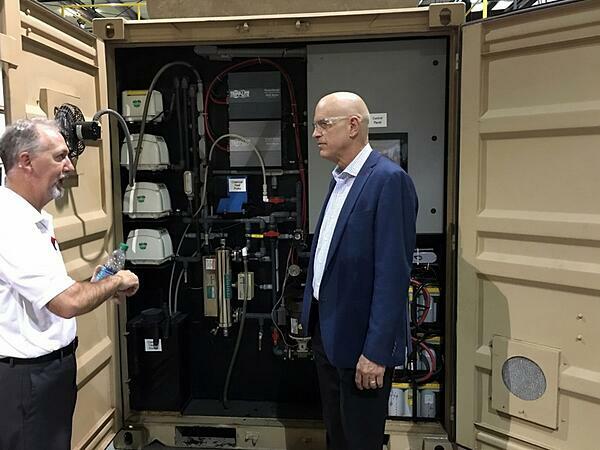 In this picture, Dan is showing me a treatment system for US Army Forward Operating Bases, specially designed for ease of operation by regular infantry. Dan applied what he learned here, and in many other challenging water treatment situations, to build his amazing (and very profitable) product line for us. Join me tomorrow, Thursday, at 5PM Pacific Time, for my interview of Dan. Just click here to book your spot. See you on the call! PS: there’s a limit of 100 listeners, so sign up now…!